Ending speculation over the next course of action, the crumbling Jet Airways finally announced that it will temporarily suspend operations from Wednesday night. The development came after the State Bank of India-led consortium of lenders rejected the airline's plea for emergency funds. Tonight 9W-2502 (Amritsar-Bombay-Delhi) will be last flight of beleaguered airline before a temporary closure. Jet Airways had asked lenders to release an interim fund of Rs 400 crore after its current operational fleet further shrunk to just five aircraft. The airline, in a filing to stock exchanges, said that the SBI, on behalf of the consortium of Indian lenders, informed last night that "they are unable to consider its request for critical interim funding". "Since no emergency funding from the lenders or any other source is forthcoming, the airline will not be able to pay for fuel or other critical services to keep the operations going. Consequently, with immediate effect, Jet Airways is compelled to cancel all its international and domestic flights. The last flight will operate today," Jet Airways said in the filing. "The decision has been taken after a painstaking evaluation of all alternatives that were made available to the company and after receiving guidance and advice on the same from its Board of Directors," the crisis-hit airline said. The airline has also informed the DGCA, and the ministries of civil aviation and finance, and other relevant government institutions of this course of action. The airline will now await the bid finalisation process by SBI and the consortium of Indian lenders, Jet said, adding that it will continue to support the bid process initiated by the banks. In its response to the airline, the lenders have said, "The Expressions of Interest (EoI) have been received and bid documents have been issued to the eligible recipients today. The bid documents inter alia has solicited plans for a quick revival of the company. The bid process will conclude on 10th May 2019... We are actively working to try and ensure that the bid process leads to a viable solution for the company." 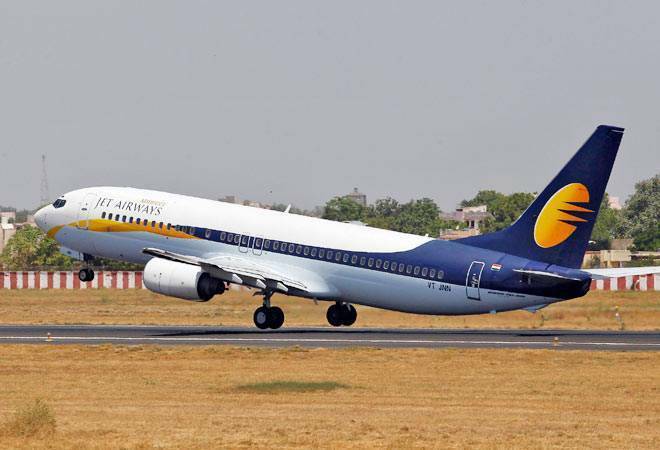 Earlier today, BusinessToday.In had reported that Jet Airways may suspend its operation temporarily after banks refused to infuse Rs 400 crore in the cash-strapped airline. It was reported that grounding operations could come anytime soon. The Jet Airways board had authorised chief executive Vinay Dube on Tuesday to make one last appeal to the SBI-led consortium to get a life-line of Rs 400 crore on Wednesday, before taking a final call on the future. Jet Airways is the seventh airline to go down since May 2014. In the last five years, airlines like Air Pegasus, Air Costa, Air Carnival, Air Deccan, Air Odisha and Zoom Air have all gone belly up. On March 25, Jet Airways' board had approved a debt-swap revival plan, under which the lenders were supposed to release an emergency loan of Rs 1,500 crore and, in turn, acquire a majority stake in the airline. But, thus far, they have disbursed less than Rs 300 crore, that too in small amounts, citing procedural delays. On Tuesday, the Mumbai-headquartered airline had informed the bourses that its operations have been severely impacted in the last few days due to acute fund shortage. "The company has reached out to our lead lender, State Bank of India yet again and stressed on the need for urgent funding requirements, critical to the continuation of the operations of our airline," Jet Airways said in a filing to BSE. Earlier on Monday, Jet Airways' pilots appealed to the SBI to release Rs 1,500 crore for the airline. The National Aviator's Guild (NAG), Jet's pilots' body, also asked Prime Minister Narendra Modi to help save 20,000 jobs.